Think Monticello Motor Club and you think of the long back straight. But the rest of the track is tight and very technical, giving the Mitsubishi Evo X MR good odds against the CTS-V tomorrow. Here's how I can win. The full 4.1-mile course at Monticello is a monster, with 20 corners and three straights. The Cadillac CTS-V isn't just muscle and no cornering, but with torque vectoring differentials and weighing 600 Lbs less, the Evo is still going to give it a run for its money. At the very least, this should be a close race. Here's my own turn-by-turn analysis of what challenges Lutz and I are going to face tomorrow, who's going to have the advantage in which sections and where it's most likely we'll see the 77-year-old crash his 556 HP Cadillac. Description: The map does neither the tightness of this corner nor the lack of runoff justice. A near 90-degree left hander taken at the bottom of 2nd gear, the downhill braking zone for which comes at the end of the second longest straight on the track. Analysis: The more powerful CTS-V will reach a higher speed on the straight, meaning it'll need to brake earlier. The Caddy has a huge understeer issue in this corner if you try to push it, meaning Lutz will basically have to park the car, throwing away the corner and therefore the setup for 2. Description: You take a late apex through this 2nd gear right hander in order to get your power down early so you can accelerate through turn 3. Analysis: The Evo will be better setup going into this corner and, thanks to AWD, will be able to get its power down much earlier. Description: Sweeping right hander flat out in third gear. Don't track out all the way on the exit so you can brake in a straight line for turn 4. Analysis: The Cadillac's power advantage will help here, but the Evo will benefit from a cleaner exit from turn 2. Description: A deceptively tight right hander with plenty of grip thanks to slightly Itpositive camber. 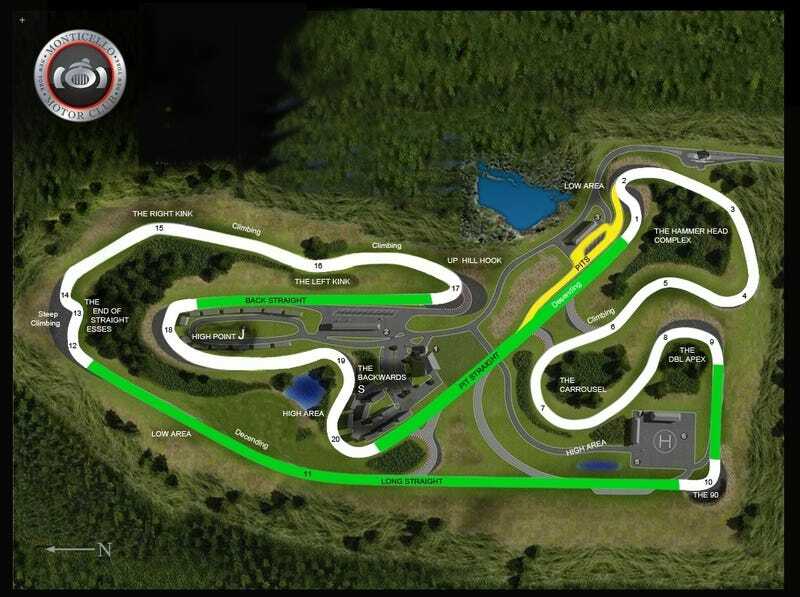 Description: The reverse esses, you can straighten this out pretty effectively so just power through and end up on driver's right for the entry to turn 6. Analysis: Not much to say, just don't overcook it into 6. Description: The Carrousel. Very wide, very long, 180-degree, uphill corner. Analysis: A difficult turn to hit the right line in, you're supposed to stay out to the right till 2/3 of the way through, then tuck into the apex. You want to use as much power as possible from the apex out without straightening your wheel as it continues to curve to the left all the way up to turn 8. Description: The Double Apex. It's actually more of a single late apex as you brake and turn late into 8 to hit a late apex on 9. Third gear. Analysis: It's all about getting 9 right so you get a good exit onto the short straight leading up to 10. Not terribly challenging once you figure it out. Description: The 90. A 90-degree right hander that leads on the very, very fast back straight, so exit speed is everything. Analysis: Deceptively slow, it's easy to wait too late to brake then run wide, screwing up your exit. You don't want to do that. Slow in fast out. Slow in fast out. Sacrifice the entry speed for exit speed. Description: An incredibly fast straight with a light sweep to the right. Turn that corner into a much of a straight as possible. Most cars, including the V end up needing a shift right in that corner, which is a little risky at such high speeds, so make sure you're in a straight line when you do that. Analysis: This is my biggest concern. The V is well north of 170 MPH back here and the Evo can't manage much more than 150. Taking the sweeper flat out with an upshift is a pucker moment and the opportunity does exist to get it very wrong if you aren't careful with your weight transfer while shifting the Cadillac. Description: The End Of Straight Esses. The map doesn't do this corner justice as there's a fair bit of elevation change. Uphill braking area for 12 helps late braking and turn-in, but there's a peak on the apex of 13 and it's a very tight, 3rd gear corner. Lots of weight transfer across the vehicle's front-to-rear and side-to-side axis. Analysis: This is where I have to make up the time I'll lose on the straight. Lutz is going to be travelling considerably faster so will have to brake earlier and harder. If he doesn't, he'll lose it in 13 or at least screw up there, which'll mean he ruins 14 and the exit into the short straight that follows. Description: A right hand kink with a standard line, you can carry a lot of speed and then get on the power hard and early. Analysis: You think it's faster than it is, but still, this is a power corner. Description: The Left Kink. A left sweeper over a blind crest. This is the corner that will catch you out if you're going too fast. Analysis: The blind crest fools people into treating this like a straight and carrying too much speed through. You need to lift slightly just before you crest the hill, but of course if you lift too late you spin. You need to be very smooth on the downhill then turn the entry into 17 into a straight, you'll need to brake a lot for the next corner. Description: A very tight hairpin. Another slow in, fast out corner where you want to sacrifice entry speed to get the power down as early as possible. Use the full width of the track on the exit. Analysis: The back straight isn't that long, but it's still a straight coming off a very slow corner, so you're basically setting yourself up for a drag race and there's just no getting around the CTS-V's power advantage. Description: A weird corner that I've never gotten 100% perfect. It's another apparent double apex that works better as a late single. Analysis: There's a bump on the second apex and you don't straighten out completely on the exit while still needing to be on the power hard. I'm hoping that bump and the general trickiness weigh things in my favor here. Description: The Backwards S. A fairly standard right hander with an entry that curves to the left. You need to compromise this corner so you can be all the way to driver's right for the entry to 20. Analysis: Banking makes this corner a breeze, but it's all about setting yourself up for 20, not carrying speed here. Section: Turn 20 and the pitt straight. Description: A tight left hander that sets you up for the back straight. Stay out late, hit the apex and nail the throttle. Analysis: The Evo will be able to get on the power earlier, the CTS-V has more power. It's advantage in speed on the straight will be less than you might think, especially since it'll have to brake so hard for turn 1.